Approaching the water* I notice I am once more doing the arms-raised thing. This is not the impending cold water, it is July and the water’s lovely, this is my subconscious insisting on believing I actually weigh less with my arms in the air: this is my special walking-over-ouchy-shingle walk. I have been known to exit from the sea on all fours, but I hate swimming in shoes more than I hate the brief discomfort and indignity. *To those unfamiliar with the sea at Clevedon – that is the yellow-brown waviness at my feet. It’s a colour you get used to. You may call it the Bristol Channel, but we call it the sea and are happy it’s there. 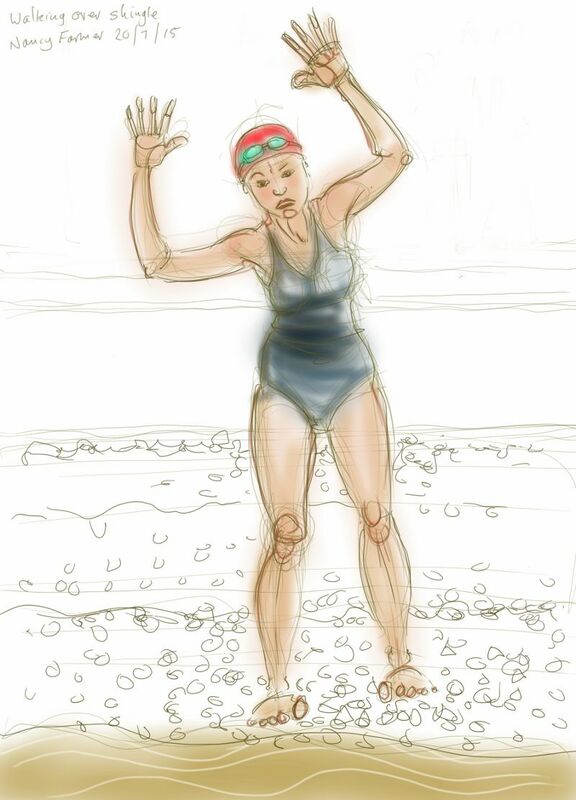 This entry was posted in swimming and tagged art, cartoon, Clevedon, Clevedon beach, drawing, sea swimming, shingle beach, sketch, swimming on July 20, 2015 by Nancy Farmer.